Join us for live remotes for Fast Change Operation Soldier Care! Saturday, July 29 from 1-4 p.m.
Wednesday, August 9 from 2-5 p.m. Everyday thousands of US soldiers across the globe sacrificially risk their lives for you and I. A lifetime compensation plan, a free education, a purple heart…. Nothing could ever begin to repay these brave men and women for their commitment to this great Country. 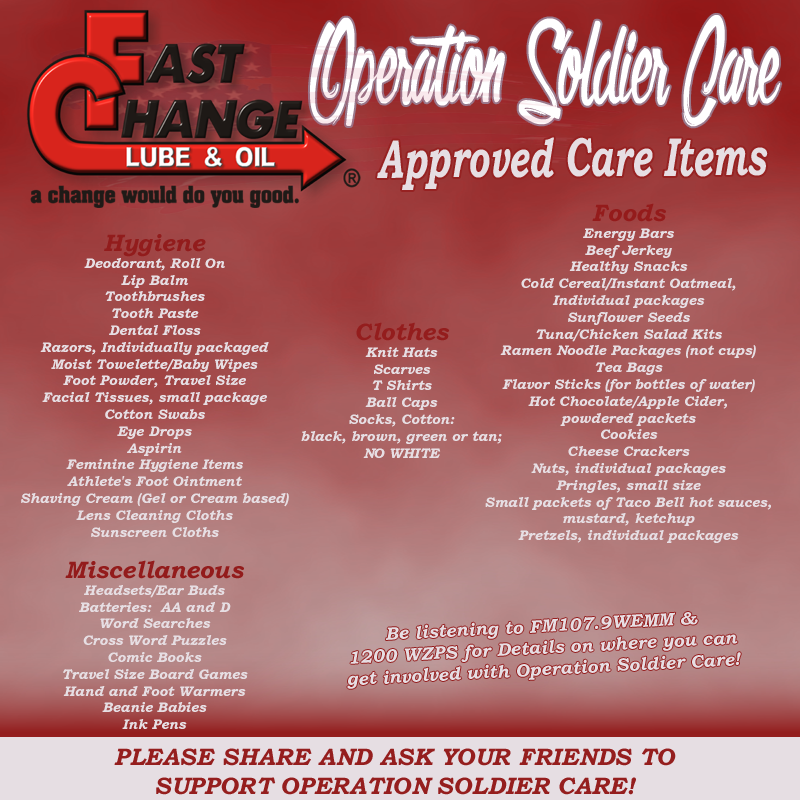 The Fast Change Oil and Lube Operation Soldier Care will take place at various locations across the tri-state. Be listening for broadcasts on location and different drop off points. At the end of the 10 week tour, Military Missions in Lexington will assemble the care packages and distribute them on behalf of our listeners. It’s time to honor our brave men and women… God bless you from FM107-9 WEMM and 1200 WZPS… The Spirit!